Honda has started exporting its new Swindon-built Civic hatchback to the US as it begins to put the job cuts and production setbacks of recent years behind it. The car, the 10th generation of Honda’s top-selling model, is the result of a £200m investment by the Japanese firm in its giant South Marston plant, upgrading the factory into the global manufacturing centre for the car. Honda this week said it had recruited more than 650 new workers at the plant – run by its subsidiary Honda of the UK Manufacturing (HUM) – especially for the new Civic, taking the total workforce up to around 4,000. Production of the CR-V compact SUV (sports utility vehicle) will be transferred from Swindon to a sister plant in Ontario, Canada, by the end of next year - meaning that Swindon will then become a one-model plant for the first time since car production started with the Accord in 1992. 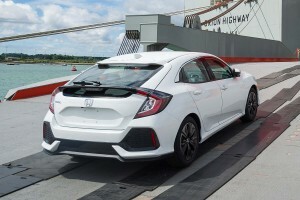 While the first Civics bound for North American showrooms left Southampton docks and will go on sale to US drivers next month, UK and European drivers will have to wait until early next year to get behind the wheel. HUM director Jason Smith said: “It is a testament to our workforce that we have been chosen to deliver the 10th generation Civic hatchback. Honda said the 10th generation Civic was one of the most comprehensive new model developments ever undertaken by the brand. The finished look of the car has been a closely guarded secret. Honda displayed a concept model at the Geneva Motor Show earlier this year and there have since been a number of leaked images and amateur spy shots on the internet. 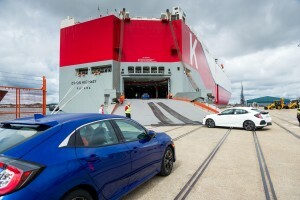 Official photos released by Honda this week, above and right, showing the US-versions being driven onto a ship at Southampton appeared to catch enthusiasts napping – although the immediate reaction from motoring writers was positive. Production of the European version will start towards the end of this year. Around half the output will go to Europe, with the other half exported to key markets across the world. Jason Smith added: “The whole team have shown a real determination to produce a vehicle of fantastic quality that lives up to the Honda Civic name. While the Swindon plant has the capacity to produce 250,000 vehicles a year, over recent years it has built less than half that number as Honda’s European sales have come under pressure from the recession. More than 1,000 jobs were axed at the plant during the depth of the recession – taking total staffing levels to below 3,000 for the first time in a decade – and one of its two production lines was closed. Hundreds of jobs also went in suppliers to the plant, reflecting Honda’s importance to local economy. However, recent recruitment means the plant now employs around 4,000 people. HUM also manufactures engines on the same site.